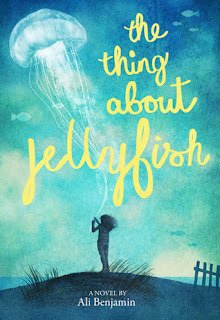 The Thing About Jellyfish is a beautifully written middle-grade novel, and it is full of clever and witty writing. Benjamin was constantly sending me through moments of laughter and joy as well as moments of true sadness that lingered with me, pulling at ever single little string in my heart. The first few pages sucked me in right away and brought me back to my middle school days. The words were expressive, raw, and made me feel like I was experiencing them in real life and not just on the page. There were many times throughout the novel where I had to stop and re-read paragraphs because they were so touching. I can't say that I've read such an honest and captivating book in a very long time. Throughout the novel, the reader follows Suzy on a journey of self discovery as well as her journey to figure out why her best friend died and what caused the downfall of their friendship. Suzy attempts to study and pick apart the days leading up to the "accident" in order to truly figure out why it happened. She seems to believe the cause of her friend's death is by a lethal jellyfish, so she throws herself into research in order to find an answer. Suzy is an incredible young lady who does the best she can navigating through some of the toughest years of her life. There is much to be learned from this young lady and this great novel. All in all, The Thing About Jellyfish is a fantastic read, not just for middle-aged readers! There were so many wonderful quotes that I will continue to read over and over. I would highly recommend this book to readers 12 and up.